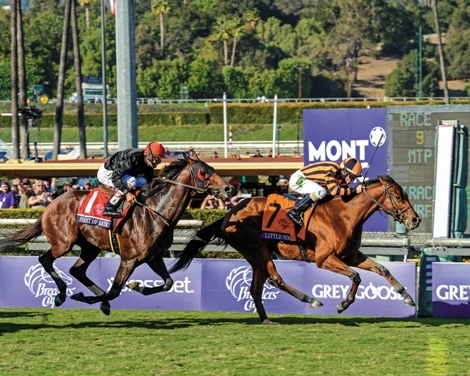 The program was set up with the idea that it would have to be aggressive, with only one goal—the Breeders' Cup Turf (gr. IT)—in mind. For any other runner it would have been a tall task, but five-time grade I winner Point of Entry sailed along his road to recovery from a condylar fracture suffered in early June. From surgery to rehab to a powerhouse breeze on Sunday morning that set him up perfectly for his Breeders' Cup return, the Phipps Stable homebred continues rounding into top form in time to contest the race he lost by half a length to Little Mike last year. Point of Entry's comeback from the injury he sustained while winning the June 8 Woodford Reserve Manhattan Handicap (gr. IT) over extremely soft going at Belmont Park began with a trip to Rood & Riddle Equine Hospital in Lexington, where noted surgeon Dr. Larry Bramlage inserted two screws to close the fracture in his left hind cannon bone. From there, the 5-year-old son of Dynaformer was sent to Niall Brennan's Ocala farm to begin rehab. Brennan, who handles the breaking and early training of Phipps Stable runners, counts 2013 Kentucky Derby Presented by Yum! Brands (gr. I) winner Orb and Belmont Stakes (gr. I) winner Palace Malice among his program graduates. Point of Entry was at the farm as a 2-year-old before going on to become one of the top turf runners in the nation for Hall of Fame trainer Shug McGaughey. "We started out the year with the intent of Breeders' Cup being our destination," McGaughey said. "When he hurt himself, Dr. Bramlage put the two screws in and said, 'Let's just watch him, I think we can bring him back from this injury.' Everything came together perfectly and we decided to just see where he took us, and he kept progressing in the right way." On June 14, after undergoing surgery, Point of Entry walked off the van in Ocala and was welcomed back by the people who launched his career. "The whole team was delighted to have him back; they were attached to him and knew him as a yearling and a 2-year-old," Brennan said. "He's as good a grass horse as we've seen in this country for a long time. At a mile and a quarter, mile and a half, there isn't a horse in the country better than Point of Entry. It is satisfying when these horses come back, if necessary, for turnout or layout, to see how they've progressed and to help get them back on track." A major part of Point of Entry's therapy in Ocala was exercise in the Aquaciser, a water therapy system that simulates training in the ocean while offering a concussion-free, intense aerobic workout. "The Aquaciser allowed us to start him back exercising earlier, and without too much stress on his injured leg," Brennan remarked. "It was really the key. We find it's an excellent rehab tool as a horse is getting a workout in the water using their own power and facing the resistance of the water. The horses go in up to their chest, jogging in there like a regular Eurocizer versus an AquaTred treadmill. They're getting that push and fitness level while also getting some concussion on their leg, but about 30% of their body weight is suspended in the water." Brennan said the temperature of the water, which is kept around 50-55 degrees, benefits horses as well. "The water is kept cold and it naturally stays a nice, cool temperature," he explained. "While they're in there working out, it's also a little bit therapeutic on their legs. When they come out of the water you can feel their legs and they're cold. So they're getting a little cold-water therapy while they're working out." Point of Entry was introduced to the Aquaciser as a 2-year-old as part of Brennan's prep program, and returned to the familiar surroundings with class. "He handled it really well," Brennan said. 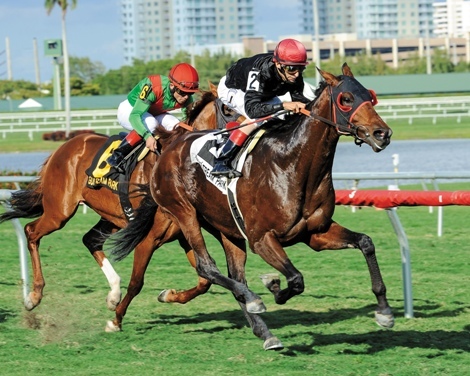 "I know at the track he's a good-feeling horse, and he's a big guy, but he was quite settled and very confident here. He was in the Aquaciser as a 2-year-old anyway, so he knew the Aquacizer and he likes it in there." After about a month, Point of Entry was started back under tack and began shedrowing for about 15 minutes each day with Aquacizer sessions in the afternoon. He soon began trips to the track on Brennan's farm. "We'd take him with the pony and let him go out ahead of everybody; you can do that in the farm environment, you can control your own schedule on the track," Brennan said. "He was in great form, quiet, happy. He would go a mile and a half, two miles a day on the track first thing in the morning, then go to the Aquaciser. Dr. Bramlage and my vet here followed up with radiographs and we all got together to evaluate his progress." Another therapeutic treatment for Point of Entry was the vibration plate that has become increasingly popular in recent years (it is also used by trainer Charlie LoPresti on most of his trainees, including Horse of the Year Wise Dan). "He spent 20 minutes standing on the vibration plate every morning, stimulating blood flow and bone density," Brennan said. "With those techniques and hand-walking twice a day, we were able to get exercise in a controlled environment before he was ready to have a rider up." Brennan said Point of Entry exceeded the team's expectations during rehab. "The horse is an amazing horse, otherwise we couldn't have done it," he remarked. "We have a lot of horses that we bring back from injuries but with him we accelerated the procedure more than I've ever done and it's been an amazing turnaround. He came back great and if he happened to win the Breeders' Cup Turf it would be a most amazing achievement, coming back to win against the best in the world. It's a testament to the horse and to the teamwork that went into his comeback." 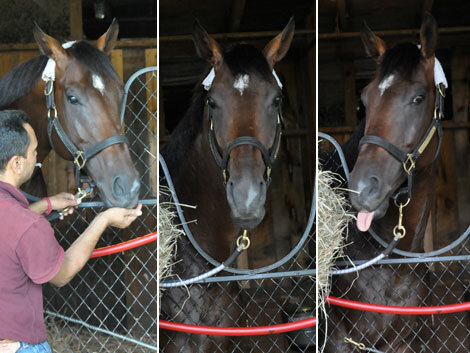 On Sept. 7, Point of Entry returned to McGaughey's New York barn to resume training. "When we started doing stuff with him, you could sort of see him slowly progress," McGaughey said. "The more we've done with him, the more he's gotten into the game. I'm encouraged by the progress I've seen him make on his own. Before we were ready to breeze him back, I just let him have some good, stout gallops. He seems to be taking all this in stride and really with the time off, development-wise and body-wise, he might even be a little bit stronger." 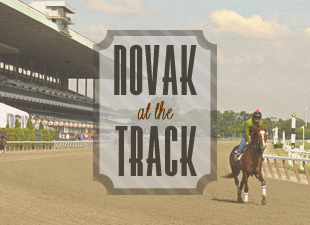 Point of Entry breezed four times on the dirt at Belmont—a three-furlong move on Sept. 14 (in :37.55), two four-furlong works on Sept. 21 (in :50.40) and Sept. 28 (in :49.93), and a five-furlong drill on Oct. 5 (in 1:02.88)—before working five furlongs on the inner turf in 1:01.24 under Hall of Fame jockey John Velazquez on Oct. 13. "So far, so good," McGaughey reported. "I thought he worked very well (on the 13th) and I liked what I saw when he came out of it. I'm excited with what I've seen. When he came here, I thought that we were maybe 40% likely to make the Breeders' Cup, then we were 50%, then we were 60%, and now I think we're in the ballpark. He might even be a little farther ahead than I thought he would be at this point." A majority interest in Point of Entry for breeding purposes was purchased by Frank Stronach of Adena Springs in early 2013; the racing kingpin also maintains half interest in the horse during his racing career this season. Point of Entry, who was bred in Kentucky by the Phipps out of the Seeking the Gold mare Matlacha Pass, currently has a 9-3-1 record from 17 starts, with earnings of $2,314.490. Earlier in the season he defeated 2011 Kentucky Derby and Dubai World Cup (UAE-I) winner Animal Kingdom in the Gulfstream Park Turf Handicap (gr. IT), following up victories in the 2012 Man o' War (gr. IT) by 3 1/2 lengths, the Sword Dancer (gr. IT) by 4 lengths, and the Joe Hirsch Turf Classic (gr. IT) by 1 3/4 lengths. View Point of Entry's Adena Stallion Page. 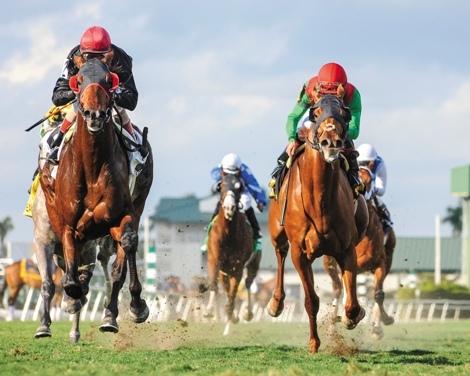 "There's no doubt it's great to be a part of the story even if it's from in the background," said Eric Hamelback, general manager of Adena Springs. "He's an amazing horse and it kind of gives you goose-bumps to think about the fact that he's come back so strong and has the will to win. Niall is such a great guy and they do a great job, and the team that brought him back gets all the credit for having his best interests in mind." McGaughey said Point of Entry will work twice before shipping to Santa Anita Park on Oct. 28. "He's an extremely talented horse, as good as I've had, and I'm letting him take me there," the trainer said. "Everybody's on the same page—we take it day-by-day, and let the horse tell us if he's back to his best. 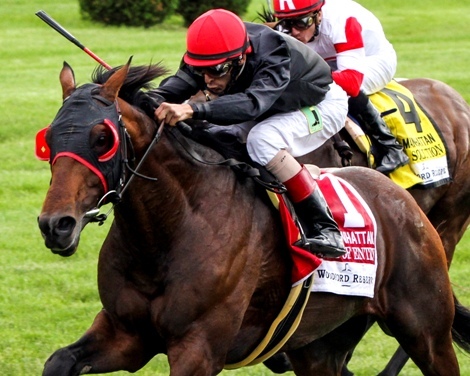 I wouldn't send him (to the Breeders' Cup) unless I thought he's got a huge chance to win."